This looks so much better than vanilla. Thank you for porting this to SE! I totally agree...the portation of this mod has been a great idea! Would an ESL or ESPFE version of this mod be possible? I don't have plans to make such at the moment, but you can always do it very easily with xEdit yourself. I recommend the latest version here, which straight up won't let you convert it if it'll break things. All you do is open the mod, click on the name, right click on the "record flags" entry and then check esl. I'll give that a try. Are there any rules to it? I mean, what's to stop me from doing this to everything in my load order (though, I'm pretty sure that's not possible)? Apparently from talking to a friend, very little. As long as you're using the latest version of xEdit, it will prevent you (theoretically) from doing it if it will break something. Got it, well, it seems to have worked. I'll let you know if I come across any problems with it. Great, please do :) Happy gaming! Do we load this after your Ashbound mod's plugin? DLC2FXAmbAshBlowing01 is the object in question and I was unable to find a nif in my mod list replacing this mesh. When I disable BDA it goes away. Any ideas appreciated I am now grooming through all of my Solthsteim textures hoping to find it. This sounds interesting...I might try it out in a year or two...when I finally get tired of Fallout 4. So not Skyrim SE ? I presume thats a typo, and we are on the correct nexus mod site ..
Then why the need for Dragonborn DLC which comes as part of Skyrim SE so is not an additional requirement in this games case. And is there an SE specific version of BDS ?, any links ? As I said, description is pretty much copypasta'd from the old one. The requirements dropdown does already link to the SE version of BDS. I've checked the pics (I already installed it, didn't test it yet) and I think you should add FAR MORE ASHES on the objects. I see the ashes on the buildings' top and they are few. 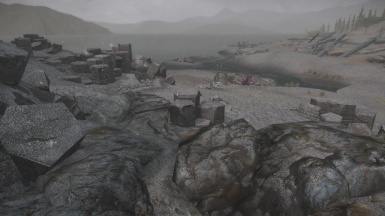 As far as I remember (since I HATE this DLC, I played once and didn't finished it), the land has STRONG SAND/ASH storms, therefore you should have added A LOT MORE ash elements on the objects. What is the reason for Better Dynamic Ash to have Better Dynamic Snow.esp as Master ? I'm asking because a quick preview of Better Dynamic Ash.esp in xEdit excludes such a "need". This can be easily cured with xEdit. Thank you very much, I was hoping you'd make this It's great Solstheim is finally getting some love! Glad to see some fellow Solstheim fans emerging :D Enjoy. So to get this right, This does the same for Ash that Better Dynamic Snow shader did for snow ?